Another week has started and with a bit of luck some of the people who visited us yesterday for the Open Day will return to adopt. We did have lots of visitors, and several people are going to think about their choice before committing. I for one salute you. Far better that than to pick a dog and bring it back immediately because it was not what you (or your partner) wanted. I freely admit that it took me three months of regular visits to the SPA before I found and adopted Lily, my aged ex-hunt beagle. It was before I was a volunteer, and although I liked several of the dogs, I wanted one that I knew was right for me and my other dog. Now I know the dogs much better there are many more I would adopt, but as a casual visitor you have very little information to go on and it is best to think first than regret afterwards. A bit like the old proverb “marry in haste, repent at leisure”. A good adoption should be like a good marriage. You make sure it is right and it is for the long term before you rush into it. A few more words about the open day yesterday. Several dogs got over-excited and a couple of fights broke out. This seems to happen at every open day (although it generally doesn’t result in bloodshed). We have been trying to work out what went wrong and what we can do to stop it happening again. One option is to no longer open on the first Sunday of the month. But what is the good of that? Some people can only make it “en famille” on a Sunday, and of course the dogs get company on an afternoon when they are normally left alone. One reason that the dogs get agitated is that people throw dog treats into the cages, rather than handing them to the dogs individually. Of course fights can break out when two dogs both rush for the same treat; even my own dogs will do that on occasion. Another thing that can be upsetting to a dog is when its kennel mate gets a walk and it is left behind. We do not allow people to walk one dog of a partnership. If there are two dogs in a kennel, then two dogs must be walked at the same time. And if one of them is not up to date with its vaccinations, then neither dog goes out. There is just no point in risking the health of the unvaccinated dog. Of course if an adoption is in the offing, that is a different thing entirely. We like adoptions! So yesterday was a mixed open day and has certainly given us lots to reflect on. Live and learn. Not much to report today, apart from the arrival of Joey Star. I actually saw this little dog yesterday during the open day. A couple had just hit him with their car in Montlegun and brought him to us. They then kindly took him to the vet (which is where any injured animal should go, but they weren’t sure what to do), where it turned out that he was fine, but unidentified. So today he is with us. 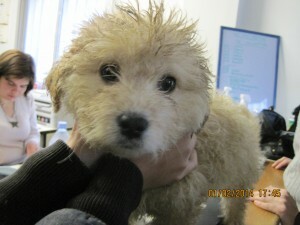 If you recognise him please tell his owners there are no bills to pay. 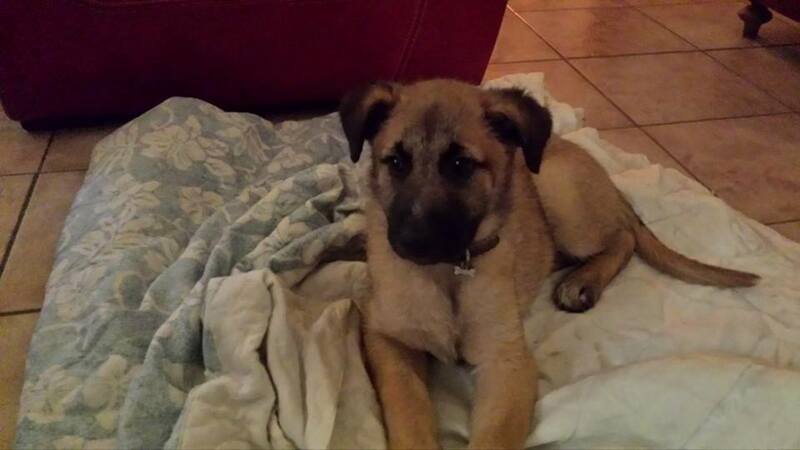 This little boy who is 5 to 6 months old would just like to be back in his home! Our ‘ Pawsitive Future’ Appeal ! In the next few weeks five of our lucky dogs will be on their way to a wonderful Association in the South East of England where they will stay in luxurious kennels where they have lots of kennel staff, trainers, volunteers and all set in 50+ acres of countryside! We are delighted to be working with this Association and have spent a lot of time and effort getting to know them. I have visited their premises, met the staff and seen their facilities and we know that they can offer a superb future to our dogs. The average turn around at this association is only 3 weeks but whilst there ,the dogs are assessed and have training as well as lots of exercise and fun. This is the chance of a lifetime for these five dogs where prospective adopters are carefully matched to each dog. With the best intentions in the world we just don’t have the resources to walk our dogs every day or do much training with them so these five dogs are indeed very, very lucky! 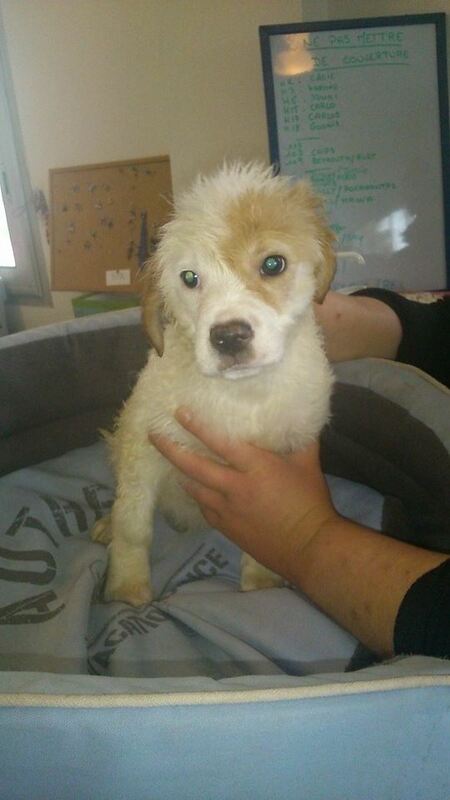 We will of course keep everyone updated with their progress; I wonder who will be the first to be adopted? It will be a long days travel for them but one day is nothing when you consider the benefits which lie ahead! As we always transport our doggies safely, in large cages and ensure that they have comfort stops every few hours we find our dogs cope very well with the journey and always arrive at their destination hale and hearty! 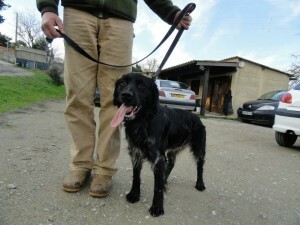 Charley, who arrived at the refuge on 1st June 2011. This wonderful boy arrived on my first ever day volunteering at the refuge so I am delighted that I will also be there as he leaves. He was adopted but returned after about a year but this was through no fault of his own so this is a fantastic chance for him to find a loving family. 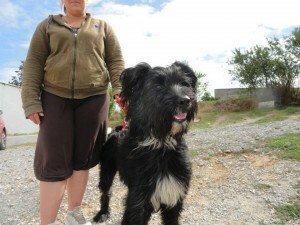 Galileo is a two year old handsome Briard cross who has been with us since September. He’s an active boy and full of fun. He will make a fantastic family dog and one thing is for sure, you won’t see many like him in England! 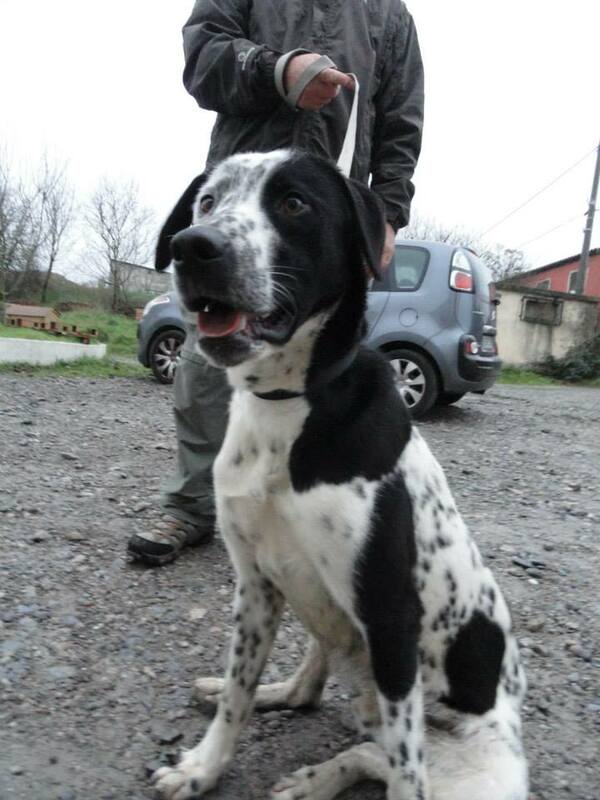 Hood is a one year old Dalmatian cross who arrived in July so has already spent nearly half of his life in the refuge and a refuge is no place to grow up in! 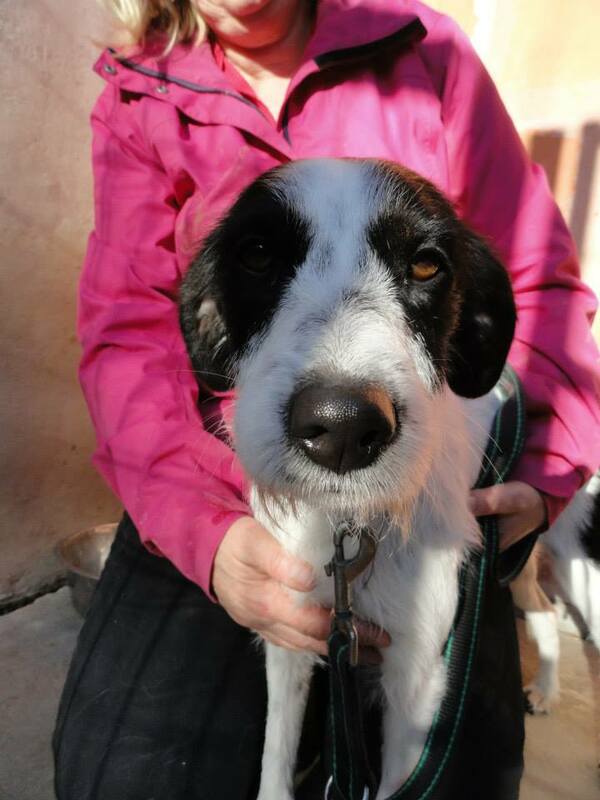 He’s a lively, clever boy who will thrive in a family who are willing to spend time with him showing him how to become the dog we know he can be. 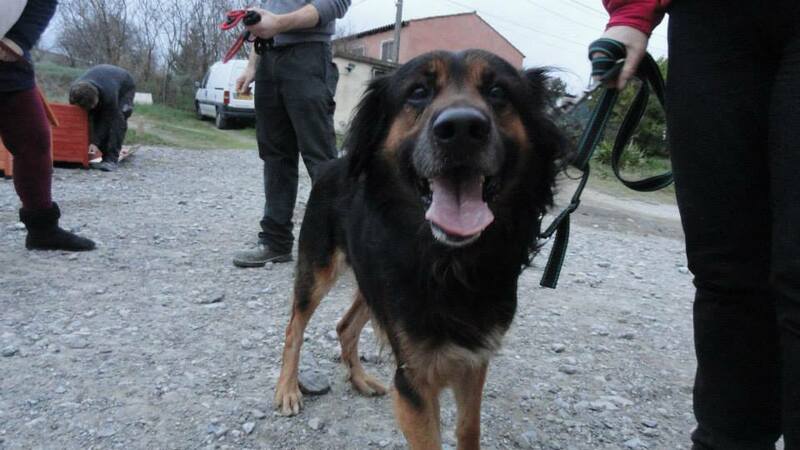 Kiko is a seven year old Shepherd cross who was abandoned in November. He’s a beautiful looking black and tan boy who gets on with everyone he meets so I am sure he won’t have a long wait before he finds his forever family. Mix is a one year old Spaniel cross Labrador who needs a bit of socialisation. 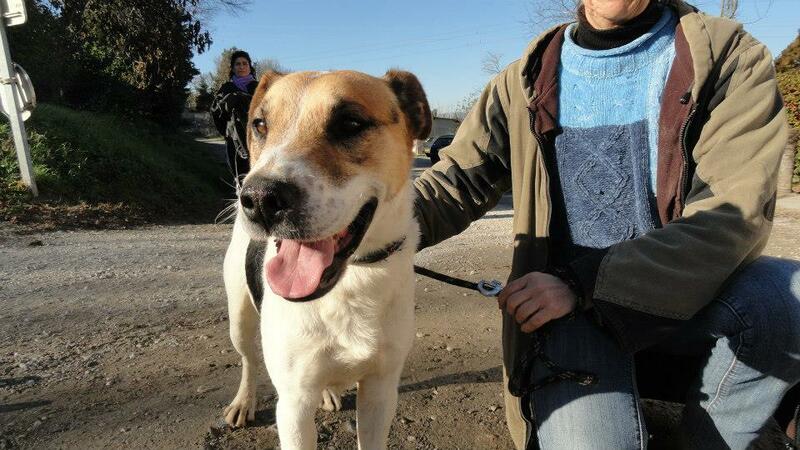 He’s very friendly with people but needs to learn how to behave around other dogs! This isn’t his fault, he has just never learnt to behave around other dogs but he’s young and clever so we are sure that he will come on in leaps and bounds! So, these 5 lucky boys leave on the 23d February and its wonderful to think that we have the opportunity to enhance their chance of finding a loving family! This is an exciting opportunity for both the dogs and the SPA Carcassonne and we are proud to be working with such a wonderful organisation who will certainly ensure our doggies have a ‘pawsitive future’! From a financial point of views all five must leave fully vaccinated (including rabies), microchipped and with pet passports and of course there are the transport costs on top of that! If you would like to help with a small donation towards their travel costs we would be really grateful! You can donate by paypal to spacarcassonne@yahoo.fr, by cheque or cash to SPA Carcassonne, Chemin de la SPA, 11000 Carcassonne, or just pop along to reception. If you like fundraising and would like to host an event for our appeal then we would love to hear from you! 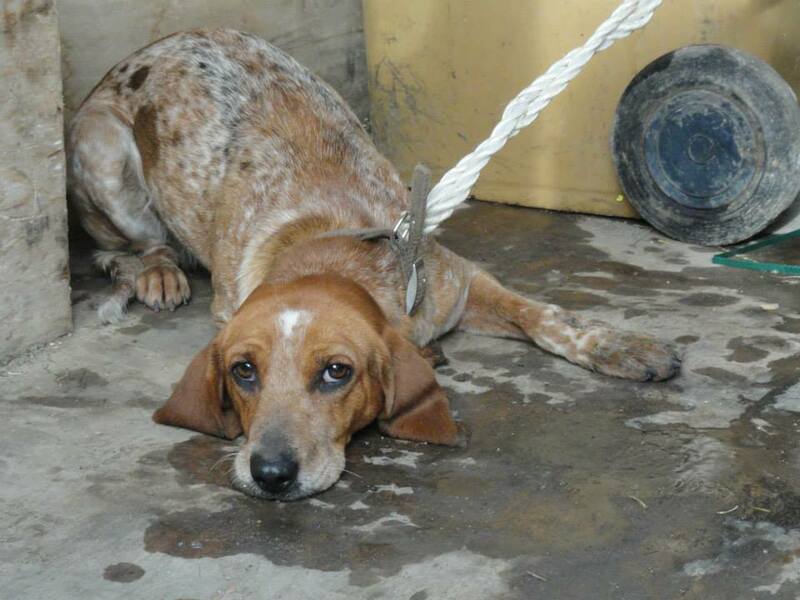 Please help us ensure a ‘pawsitive future’ for these five dogs! On a different note, today being the first Sunday of the month, we were open. 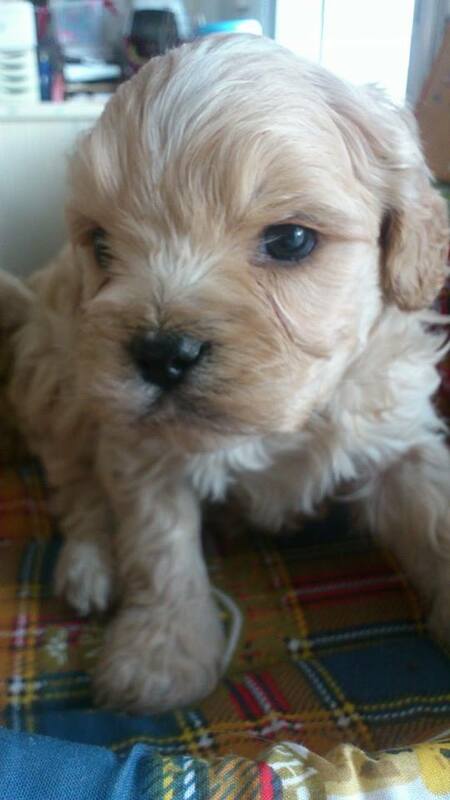 The highlight of today was the departure of Alpha, the third and last of the tiny Shih tzu cross pups. We knew that they would be popular but that’s all three adopted within a week of being put up for adoption! I wish all our doggies were so lucky! Alpha, a real little cutie! Well, today it rained pretty much non-stop, so sadly there was no dog walking. Not that the volunteers would have minded getting wet, but of course we wear coats and can get warm quickly afterwards, unlike the dogs who go back into their cold kennels. I was wondering what I would write about tonight. 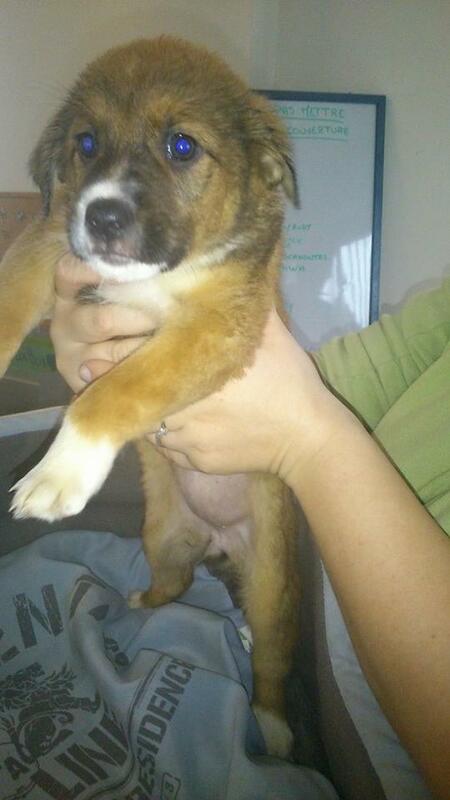 Okay, there was an adoption, that of Gamma, one of the tiny puppies who we knew would leave quickly. We were right, they became available for adoption on Monday, and within 5 days all of three of them have either left or been reserved. So not much of a blog, I was thinking. But then….at 17H45 inspiration arrived. Not in a good way, but it certainly gave me something to write about. You remember little Soprano, who was adopted on Monday? Well he was brought back today. Guess what he had done? Yes, strangely enough the answer is e. The dog was perfect. The reason given was “I wanted to please my wife, but she doesn’t want a dog”. Rude comments about pleasing one’s wife aside, what sort of person adopts a dog without discussing it with their partner? We expressed our outrage, naturally, but the bloke could see nothing wrong with his actions. He even said “but the dog has spent a lovely week with us”. Not appreciating at all that a dog is a living being and that he will have no idea at all what he has done wrong. We were all standing there, and I for one was praying that this moron was going to ask for his money back. Sadly (or wisely from his point of view) he didn’t. The selfishness of people never ceases to amaze me. The man said that bringing the dog back was heartbreaking, but it was either that or “make my wife unhappy for the next ten years”. No, I think you will be able to do that without the help of a dog, somehow! Don’t forget that we are open tomorrow and the weather forecast is much better than it was for today. Come and see us, we have dogs of all shapes, ages and sizes, including a very confused little Soprano! 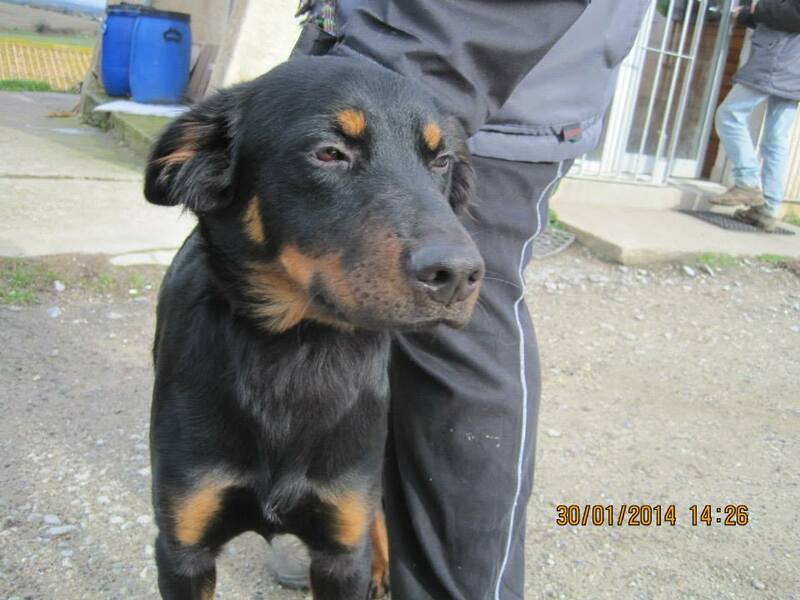 Soprano – ABANDONED. Just because. Today the beautiful husky called Anvik (whose real name was in fact Heaven) was reclaimed. Much argy-bargy on Facebook with the dog’s owner accusing us of having deliberately taken her dog, blah blah blah. Actually it was the Police Municipal who brought the dog to us, we do not actively go out to catch dogs in order to irritate people! Moreover, if the dog had been identified, we would have contacted his owner immediately. We have a lot less sympathy for people whose dogs are not identified, as you may have gathered. Needless to say, the dog is now micro-chipped. But please don’t get on your high horse with us because you have not followed THE LAW regarding identification of animals. Honestly, if I had a euro for every time I used those words I would be a rich woman. It is not rocket science. Identify your dog, keep your details up to date in Paris and then if he or she arrives at the SPA, we will phone you. I am glad Heaven is home, and I hope I never see him wandering loose around the outside of the refuge again. 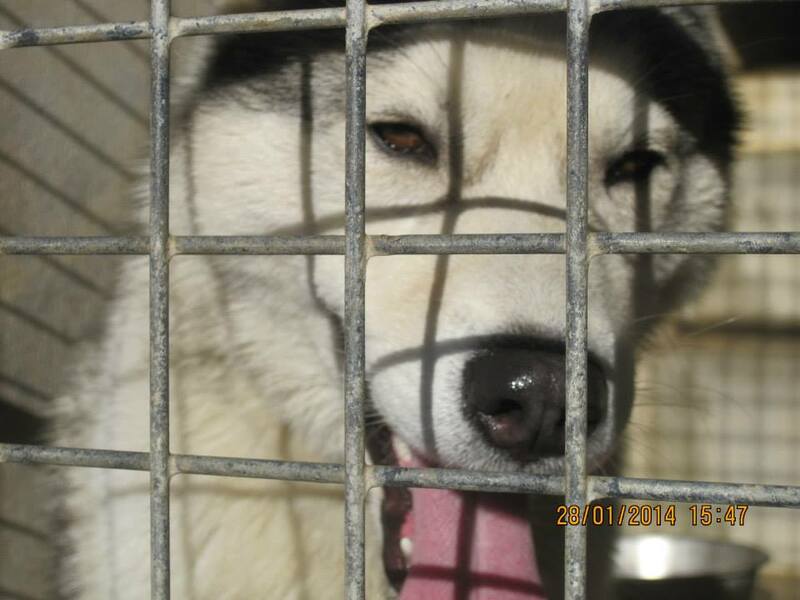 It is difficult for us to differentiate between dogs who have homes but whose owners leave them to wander all day, and dogs who have been deliberately dumped at the refuge gates. We are pretty good, but being psychic is not one of our skills. 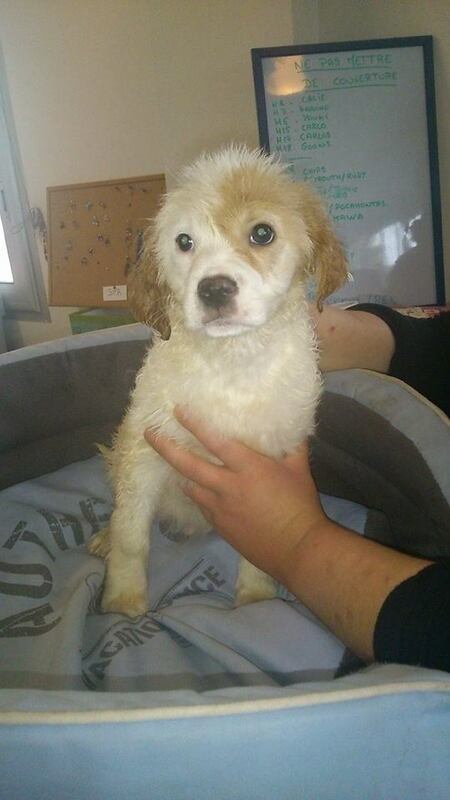 In other refuge news, Beta, one of our tiny shih-tzu cross puppies left. That only leaves one, as another is reserved. And there was another reservation too, but for more news on that, you will have to be patient! But only until Tuesday, I am not really nasty, honest! Come and see us on Sunday, we will be open and happy to introduce you to the dogs and cats, all of whom would love a new home. Anvik, aka Heaven. – leaves identified. Well, something incredible happened today. We have known about it since Monday and the excitement has been palpable, but patience is a virtue. Today our lovely boy Bench found his home. Not a new home, he found his REAL home. 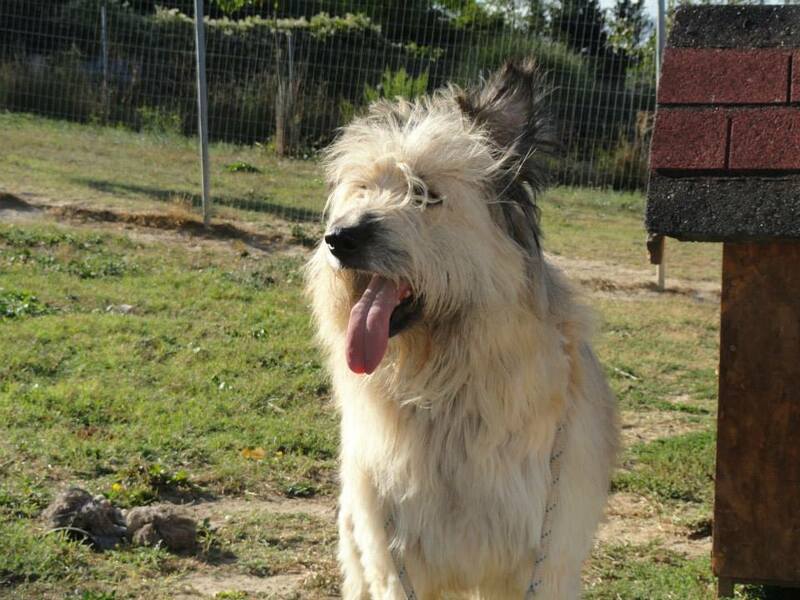 The story is complicated but basically involves a divorce and a husband supposedly rehoming the dog to someone in Corsica, but in fact leaving him to stray, which resulted in his being brought to the refuge. Bench arrived in July 2013, and several people have been interested in him. He was even featured in the British magazine Dogs Today, thanks to Moira, who quite often sends details of our dogs to this well- respected journal. In fact he nearly found a home due to this publicity, and it was only a matter of timing that stopped him hitching a ride to the UK with Rebecca and James in mid-January. Like many of our dogs Bench (or Balou, to use his real name) has a sponsor at the SPA. Last weekend his sponsor, Chantal, did a wonderful montage for Bench. It was this that was spotted by Balou’s owner, who doesn’t even live in this department! She phoned the SPA on Monday and arranged to collect him. So anyone who wonders why people bother making montages and sharing pictures of dogs on Facebook, there is your answer! Sadly not all the news was good, as three new dogs arrived. Lovely Calysta was found at Saissac and brought into the refuge by a couple we know and with whom Calysta had spent the night. She is okay with dogs and cats, so with any luck this young beauceron cross will find a home soon. 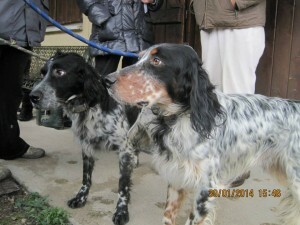 The other two arrivals are two setters, presumably brothers, who were found in Roullens. One of them made us think so much of dearly departed Alex (of blessed Doglinks), but we resisted the temptation to use the same name. 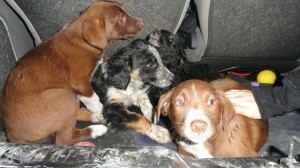 Instead they are called Hunter and Barbour; good outdoor names for two countryside loving dogs! Don’t forget it is the open day this Sunday, so why not come and see us! Bench- Reclaimed after seven months! A relatively quiet day at the refuge today, with the only event of note being the departure of yesterday’s arrival, Batman. That is not his real name of course, but when his owner collected him there was such excitement that no one thought to ask what it was. 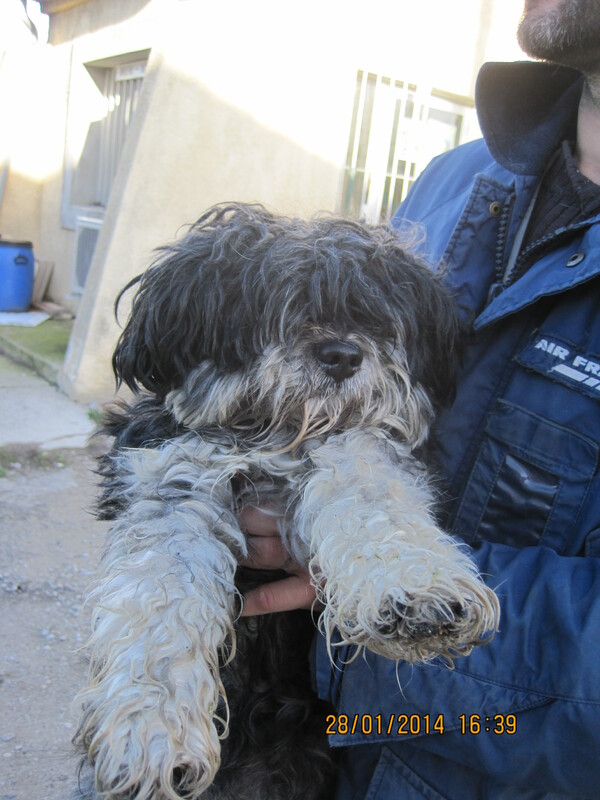 Great news for this little dog but, without wishing to point fingers, if even people in local government do not follow laws on dog identification, it is clear what an uphill struggle we have. Sigh. In the absence of other news, I thought I would mention the fact that we have plenty of puppies right now, so if you or anyone you know has been waiting for a pup, now is the time to visit us. We have 3 litters at the refuge which making up a total of 10 pups. Three are bichon crosses (one of whom is reserved), and are going to stay tiny. Three are shepherd crosses who will be medium to large and 4 are a mix of shepherd and spaniel (the puppies of Patrol, the lovely German shepherd cross who was brought in last week). 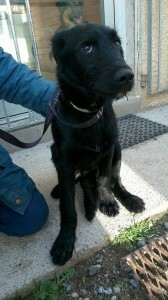 We also have one a female malinois cross, Leia, who is in a foster family so is well on the way to being house-trained. All are adorable, of course, and assuming our recent blogs on toilet training and education have not put you off, maybe one of them will steal your heart! And don’t forget, with at least two excellent dog training schools close to Carcassonne and free advice on offer, as well as other training schools and even private lessons available a bit further afield, there is plenty of help around should you need it. I also wanted to draw your attention to the lovely blog written by the mum of recently adopted Flo (ex Froggy). Just read this, and if that doesn’t make you smile, you are in serious trouble! One of the Peter Pan litter. Going to be big dogs! My refuge day started early today, as I arrived in the morning to meet Tootsie’s new dad. Barry’s wife Ann has already adopted several elderly dogs from the SPA, all of whom live out their lives in luxury in the Landes. Today Tootsie was renamed Kimmie and went to live with Ann’s menagerie. If you look at the arrival photos of Tootsie and those taken once she had recovered from her neglect, you will see what an amazing job the SPA does. Tootsie even went through a period of being epileptic due to weight loss and stress. She is now free of this illness (which can indeed be temporary). But Ann had decided to adopt her before this good news was known; she is one of those all-too rare people who are not put off by illness in animals. 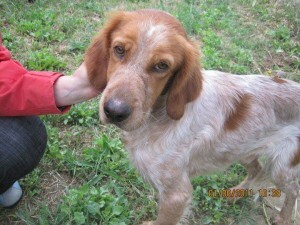 This afternoon another dog left us, little Zaz. She didn’t make it onto the site, as she was reserved so quickly. Fabulous for her! The rest of the day was not so good. A shih-tzu arrived, found in the nearby village of Montlegun. He is seven years old and well-groomed, but is not identified. Sigh. 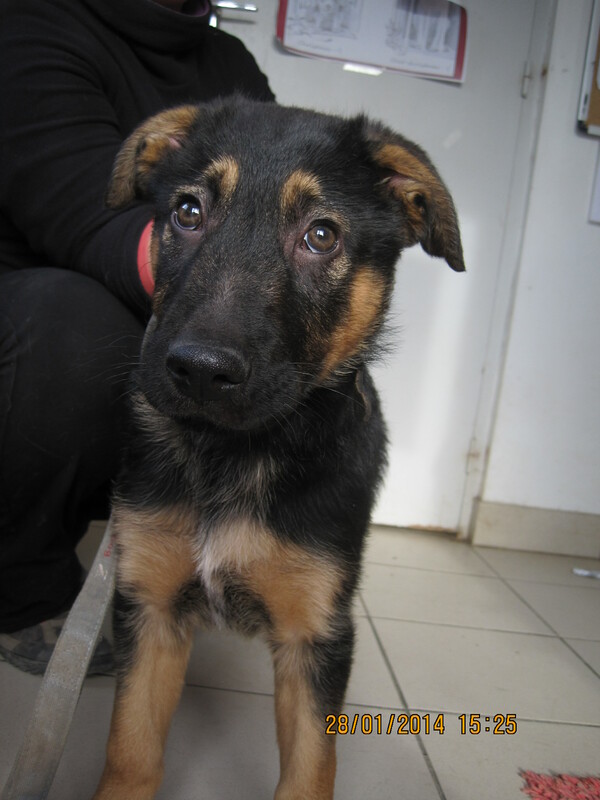 In addition two more young dogs arrived; the first a young shepherd cross who was found in Villegaihenc and the second a young cross breed who arrived with two young children and a bizarre story of having been given the dog by their father, who had supposedly found it. But that their mother does not want them to keep it. Hmm. No comment. 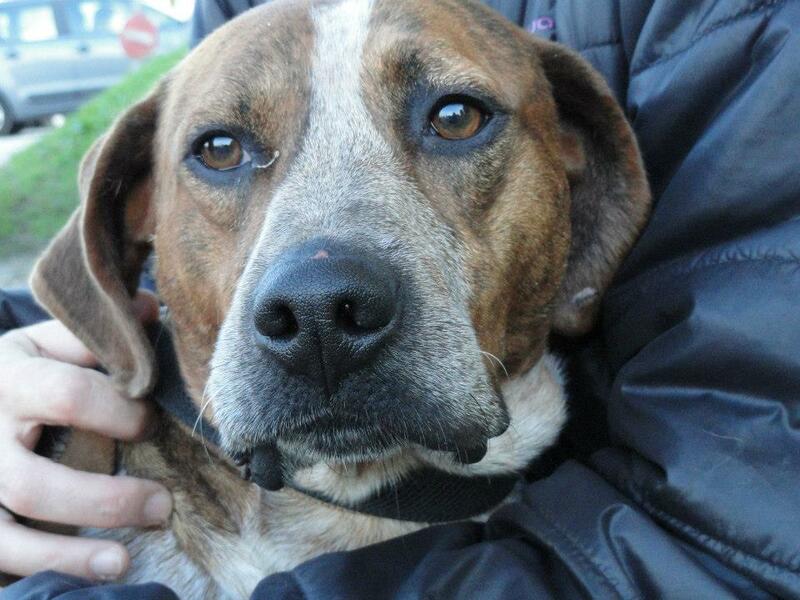 Except that this is a lovely dog and I am glad he is at the refuge! So two out and three in. Not the best of days, but the best that Tootsie has known in a long time, that’s for sure! Today three dogs were reclaimed today thanks to their micro-chips. They hadn’t made it as far as Facebook, as we were reasonably sure that their owners would come and get them. And in fact a couple of them have got “previous”! But it is good to know that with a valid phone number on the central database, you can be reached if your dog arrives at a refuge. Apart from that today saw the adoption of Bondinette. 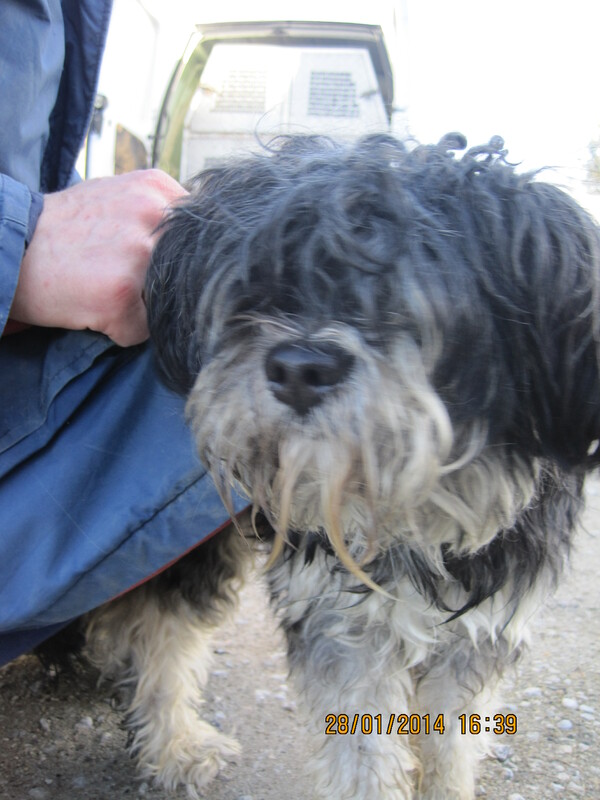 You may remember her arrival a couple of weeks ago, looking very sorry for herself in the back of a municipal truck (brought in by one of the many villages that use the SPA as their “pound”). When I saw her I thought “Uh oh”. 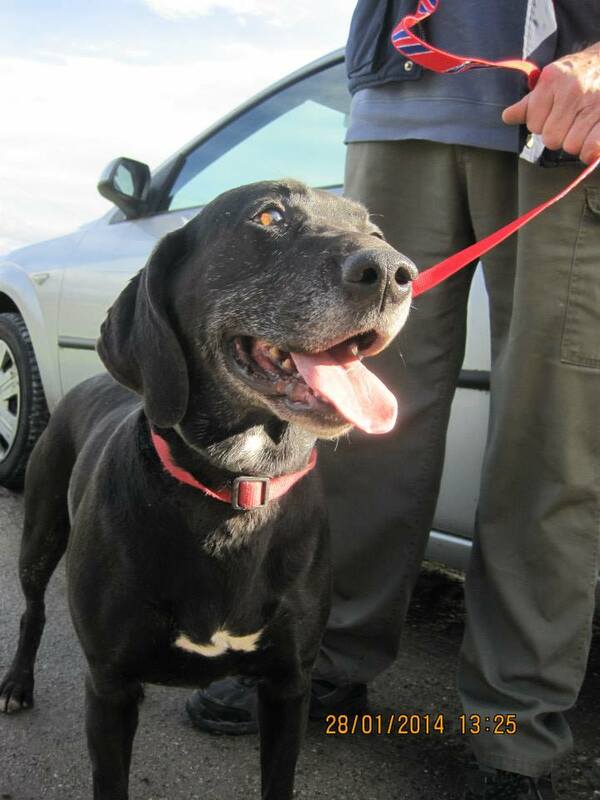 This is the sort of dog that can spend literally years waiting for a new home. Take her namesake, Bond, who has at the refuge since September 2012…..But sometimes a dog just gets lucky and Bondinette caught someone’s eye very quickly. Once compatibility with the family’s dog had been checked, off she went to be sterilised and now she is in the warmth of her new home. Bond meanwhile is still waiting. Had he been a girl maybe it would have been him that was chosen…. The reason for the high ratio of male to female dogs at the refuge is the source of much mystery. For some reason people just seem to prefer females. 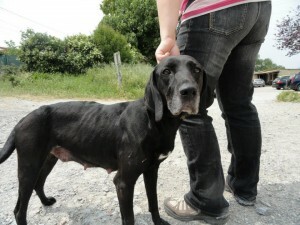 Bond is castrated, though, so he is halfway there! There was one other adoption today, that of Soprano, a little dog who arrived less than 2 weeks ago. 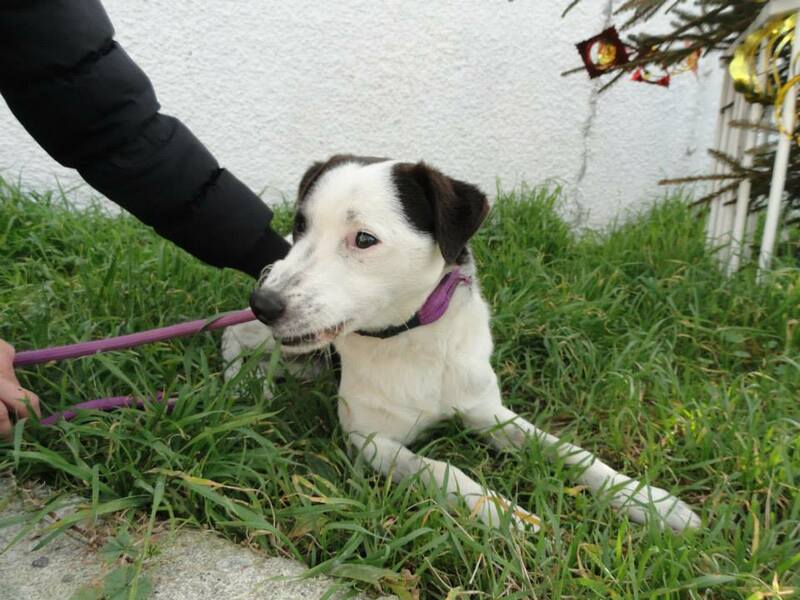 He is a sweet, affectionate little dog and probably had an owner, but as he wasn’t identified there was no way to contact them and so Soprano starts a new life with a new family. He is identified now, of course! Bond – when will MY turn come? 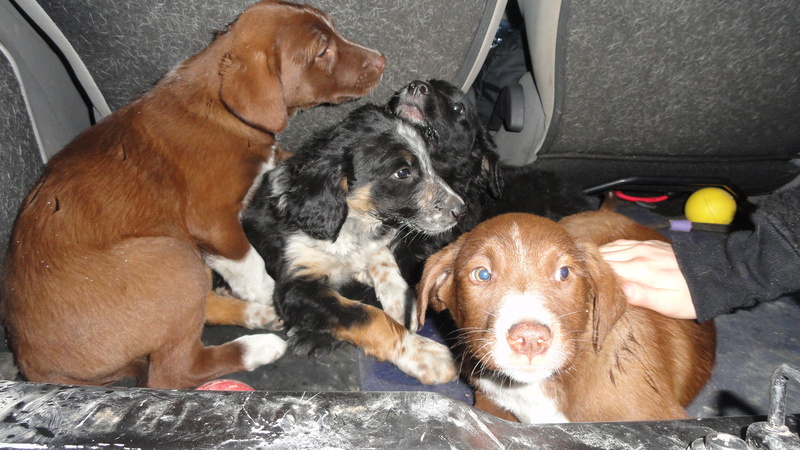 Today the refuge was closed so tonight’s blog is on a subject that we are asked a lot about, toilet training pups! Just like everyone has opinions on potty training children you will get lots of advice from everyone about toilet training your pup but at the SPA we recommend using crates to give the pups their own safe space and also for toilet training. Toilet training is all about creating good habits. Young pups have very small bladders and very little bladder control so they need to be in the right place when nature calls. And every twenty to thirty minutes in between unless they are asleep. During periods of activity change that to every ten to twenty minutes. Take the pup outside and stay with your pup, don’t nag or distract him just stroll about and once he has done what he needs to tell them him he is a clever boy. If you have to take him back in and he hasn’t done anything outside then either confine him to his crate, sit him on your lap or tuck him under your arm (small breeds only) as you go about your chores and try again in five minutes. It is imperative that you do this, especially if you have started off with newspaper down or puppy pads because your puppy may prefer to wee indoors and he could simply be waiting to be taken back in. Give him zero opportunity to go wrong. 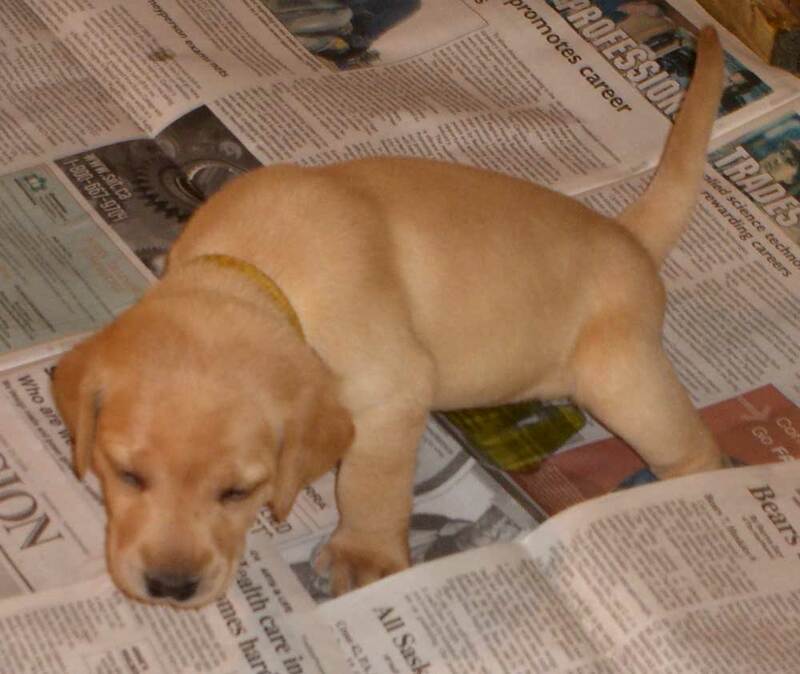 – Using newspaper or puppy training pads. Whilst it may help the clearing up process it can be very confusing for the pup that is taught or permitted to toilet in the house to make the transition to going outside and will often result in a pup that when playing in the garden will simply hold on until they are back indoors because that is where the toilet is. – Leaving the door open. This does nothing to teach the pup to toilet outside and reprimands for toileting in the house will result in a dog that believes you disapprove of what he did not where he did it and is damaging to your relationship with your pup. – Giving treats for toileting in the garden, again the dog is being rewarded for what he did not where he did it. Whilst this is not going to be as big a problem as the reprimand, the clever dog will learn to do lots of little wees and never fully empty their bladder. The insecure dog may wee indoors to appease you if you get cross about something else because they know that this is something that pleases you and gets rewarded. – Expecting your pup to tell you when he needs to go out. Once a pup understands that outside is where the toilet is then he may start to let you know he needs out. However if you are not there to ask or you fail to notice him asking then the house training will break down. 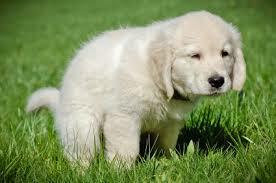 Far better to have a dog go out to the toilet on your schedule once they are house trained. – Giving your pup an ensuite in his crate. Do not encourage your pup to toilet in his crate by putting puppy pads in there. If you have to leave puppy for a while and he is going to need to go then best to have the crate inside a larger pen or blocked off area and leave the crate door open so that he can get away from his bed to toilet. During the night young pups will need to go to the toilet once or twice in the night for anything from a few days to a few weeks. If your pup is sleeping in a crate in the bedroom with you, then they will wake and should let you know they need to go out. Carry pup to the garden to toilet and then straight back to bed again. If you choose not to have his crate in the bedroom make sure you can hear him or you will have to clean up in the morning! Don’t feel guilty about having a crate in the bedroom, Leaving a puppy to cry in a crate or downstairs alone is teaching the puppy to associate the crate and night time with being distressed. Should you wish you can move his crate further away as the pup gets older and can hold on all night. The good news is that this stage doesn’t last long and as very few pups like toileting where they sleep, the crate will encourage him to wait. Before long you will have a pup that understands that outside is for toileting and will happily run to the door to do out! Clever boy…outside is for toileting! Papers help with the clean up but you are teaching the pup its ok to toilet inside. You then have to teach him to go outside so this method takes a little longer. 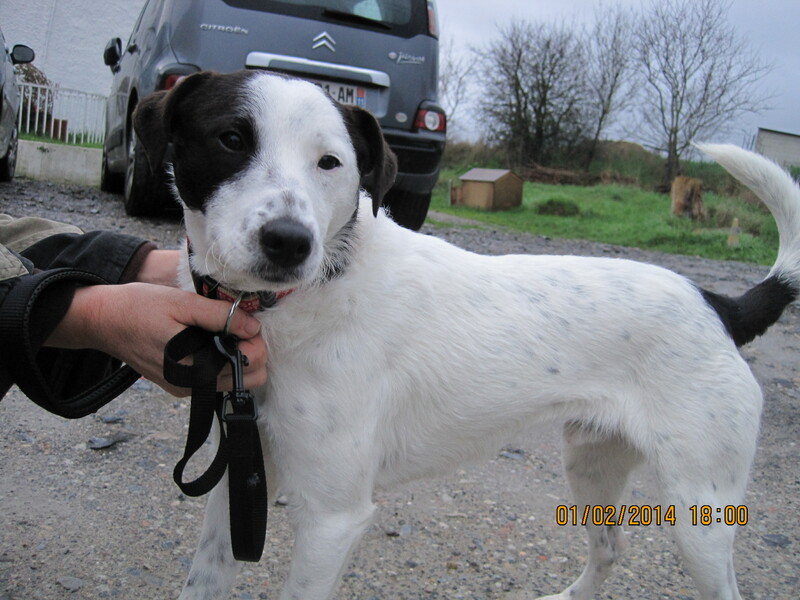 Despite the horrendous weather the refuge did have some visitors and two dogs found new homes. First to leave was Piglet. His French name was Marcassin, which is a baby wild pig. 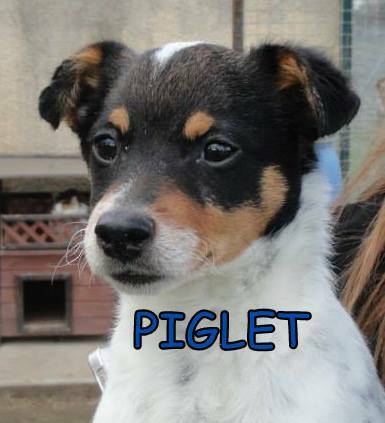 But his English name was Piglet, as with that name we were sure he would be snapped up. Sure enough a British couple came to adopt him today! It is all in the name, sometimes! The other lucky dog was Farou, who had been with us since early September. 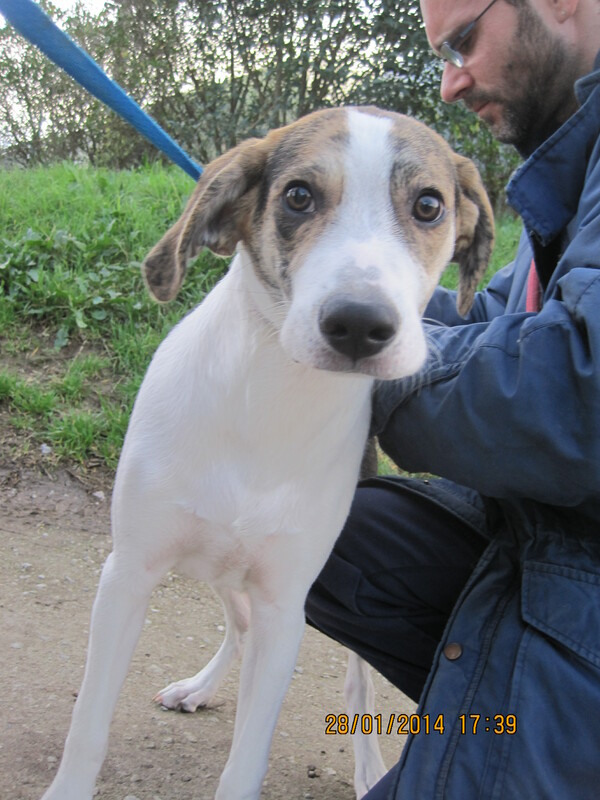 Always a favourite with the volunteers, Farou was also popular with other dogs, as he is just so laid back and easy to get on with. One lady, Andrea, who walked him whilst on a visit from her native Canada, gave him such a glowing reference that I was sure he would be adopted immediately. However it took a bit longer for him to find his new family. He left today with a small jack Russell as his new pal. Of the five dogs who arrived, three are micro-chipped and we expect them all to leave early next week, all things being equal. Of the other two one was a pre-planned abandon (due to illness) and the other was found and brought to the refuge this morning. Prepare for pictures of Cannelle and Simpson once I have tracked down my camera, which seems to have gone AWOL. Thanks as ever to everyone who showed up today. After all, what is a bit of mud between friends! Your donations help keep the SPA Refuge up and running. Anything you can give will make a huge difference to our dog's and cat's lives.